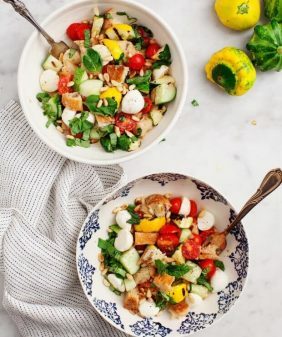 11 healthy lunch ideas that pack well for work! You'll look forward to lunch with these yummy veggie bowls, salads, sandwiches, soups and more! I think lunch is the most important meal of the day. Ok, that’s not true, I think ALL meals are the most important meal of the day, and it’s a rare day that I would skip breakfast, lunch, or dinner because when one is over, all I can think about is the next! When I worked in an office, the lunches that I packed were the best lunches I’d eat that week. They were the meals that kept me on a healthy track because when 12pm rolls around and you’re starving, it’s easy to go out and grab the closest unhealthy thing. So here are a few of my favorite healthy lunch ideas! And because I get so many questions about food storage, these snapware glass containers are my go-to for keeping food fresh. Click directly on the photos to go to each recipe. For more tips on meal prep and packing healthy lunches, and for more recipe ideas, check out my healthy meal prep ideas. If you have some healthy lunch ideas, let me know in the comments! This recipe has a base of spiced quinoa and black beans. 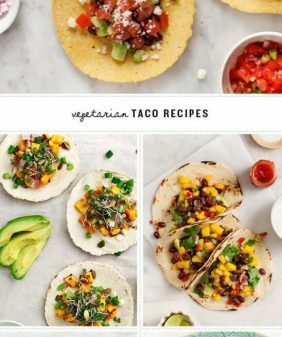 The taco toppings are customizable – if you’re packing lunch for multiple days, use finely chopped kale instead of romaine lettuce. The creamy cashew sauce will last about 4 to 5 days in the fridge. Soups are my healthy lunch recipes because they pack up well and always always taste better on the second or third day. Just reheat when you’re ready to eat. 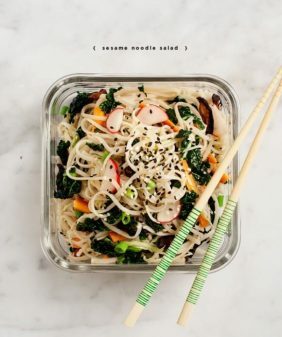 It’s fun to eat the vegetable “noodles” in this recipe, but if you don’t have a spiralizer, just chop the sweet potato and zucchini. It’s delicious either way. 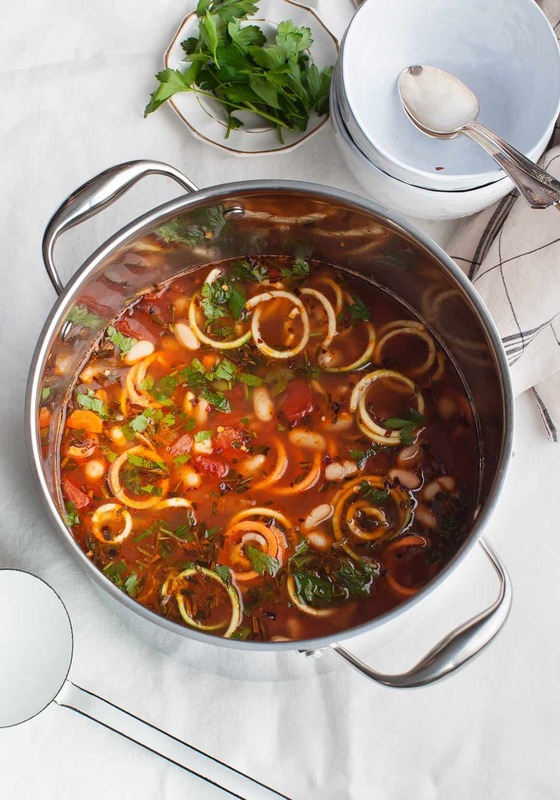 This soup is full of cheesy, tangy goodness and is great on a cold day. You can keep the croutons in a separate baggie so they don’t get soggy, or just skip them if you’re low on time or space. I made these for our flight to France earlier this year (which we missed…) but we enjoyed these wraps nonetheless. I purposely didn’t put tomatoes or avocado in here so that the wraps wouldn’t get soggy or get messy while traveling. Wrap these in foil and they can withstand being tossed in your bag (or in our case, an Uber ride to the airport and then directly home… sigh). I realize it’s not spring, but quinoa, chickpeas, and broccoli are all available year round and the pesto in here is made with frozen peas. Plus, eating this in the winter will make it feel like spring? Tahini sauce makes everything better! Broccoli, green beans, zucchini, and sun dried tomatoes in a creamy mayo-less tahini sauce. 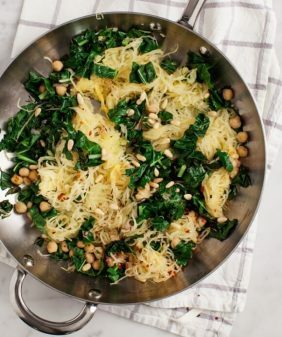 This one is really healthy if you use brown rice pasta. All of the vegetables here (and there are a lot of them) are good packable ones. This is one of those recipes that’s even better on the second day – the creamy almond ginger dressing is so yummy and tangy and really soaks in nicely. While there’s nothing better than squash roasted just out of the oven, I was pleasantly surprised how much I loved having these leftovers for lunch. You may want to pack the sauce separately. More bowls (last one, I promise) and more kale! I love this bowl because the trifecta of sweet potatoes, chickpeas, and kale is a hearty combo to get you through the day. Those little meatball looking things are veggie balls – I love them, but you can toss whatever protein you want in here. Here’s one of my favorite healthy lunch recipes when I’m in a sandwich mood. This one can be a little messy – I wouldn’t pile it quite so high as what I have in the photo and I would wrap it well with foil. If you haven’t tried tempeh, this smoky baked tempeh is SO good. Pack the chickpea filling separately from the lettuce leaves and assemble these at your desk. You can skip the pickled onions and the sauce if you want to, the chickpea filling is so good on its own! 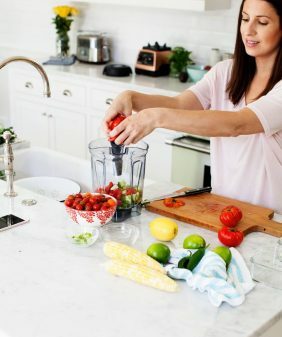 For more healthy lunch ideas, check out this post that’s full of our Healthy Meal Prep Ideas. Make the Spiced quinoa: In a medium pot, combine the quinoa, black beans, olive oil, lime juice, lime zest, chili powder, smoked paprika, maple syrup, salt, and several grinds of black pepper. If desired, heat until warmed through, then stir in the scallions. This can also be served cold. 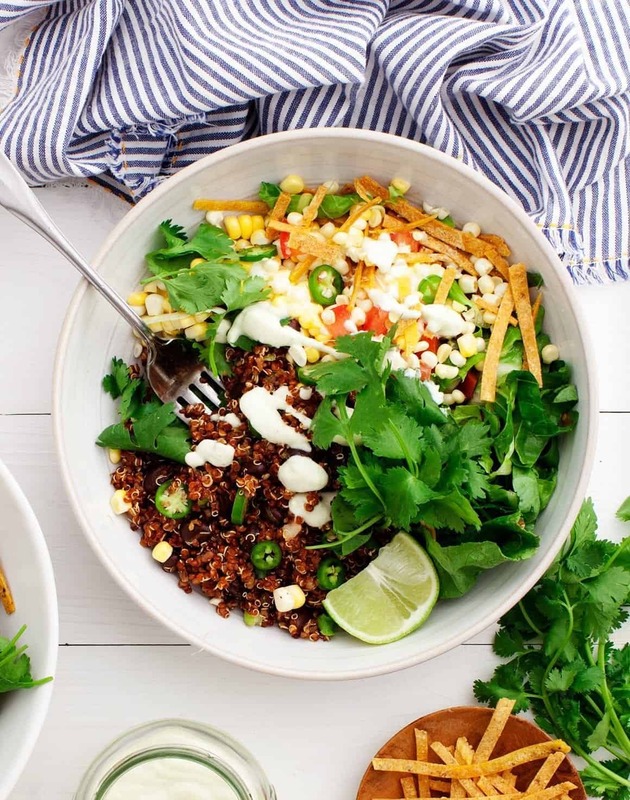 Assemble the bowls with the romaine, Spiced quinoa, corn, tomatoes, avocado, cilantro, tortilla strips, and jalapeños, if desired. Drizzle with the Cucumber Jalapeño Ranch dressing. Serve with the lime slices and extra sauce. How do I pick just ONE for lunch! wow, very inspired set of recipes, even if for dinner instead of just taking them to lunch, and of course love the healthy ingredients, thank you for all of them! A cold pasta salad that’s actually somewhat healthy? Something I can use to trick myself into actually eating broccoli? Now THAT’S something I can get behind! Thank you, Thank you, Thank you for this! My husband and I are planning on going completely plant-based very soon. For at least a month to try it out (to see what it does for our health). But we might even make it a permanent thing. My husband usually takes the standar me bread with cheese and lunchmeat to work and I was looking for alternatives that I can prepare a day beforehand and that he can just take to work in the morning. This really helps a lot!! I’m always the type of person who just reads and never comments but this post I need to say THANK YOU. I love cooking but on the week days is something I just hate. I cook all my food monday night so I can eat during the weak. I try eating healthier as I can but it’s always interesting to change the menu with good but easy ingredientes. With these recipes I have new flavors for WEEKS. So yes, thank you and I hope you continue with more posts like this. I love all of these ideas! 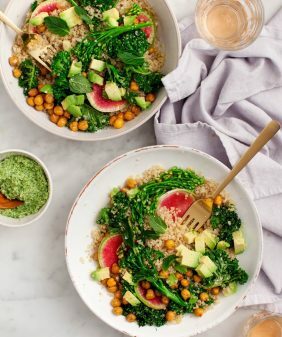 The easy power lunch bowl is right up my alley! I am always trying to find new healthy recipes to add to my meal plan. These will surely fit in nice with my lifestyle. I need to try those spinach hummus wraps. They look so delicious.